A simple offering today, but one I hope you will enjoy. 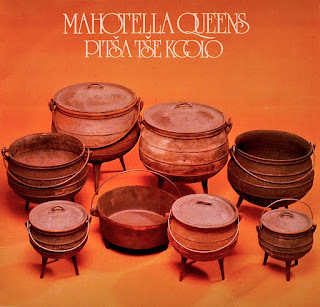 Pitsa Tse Kgolo, recorded in late 1981 and released in new year 1982, is a Sotho/Pedi language album by the Mahotella Queens, produced by Marks Mankwane and released on Gallo's Hit Special label. 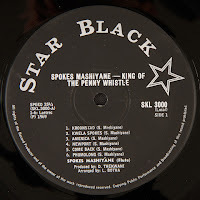 Pitsa Tse Kgolo ("the big pot" [idiom: melting pot of music]) was one of a steady stream of LPs released by the then-familiar line-up of the Queens, led by the throaty Emily Zwane. 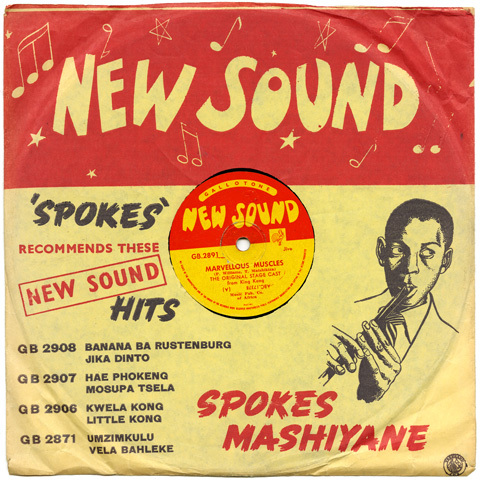 The album contains that classic Mahotella vocal sound combined with the typical early eighties mbaqanga beat - crystal clear guitar, thumping bass, soulful drums and shimmering keyboards. 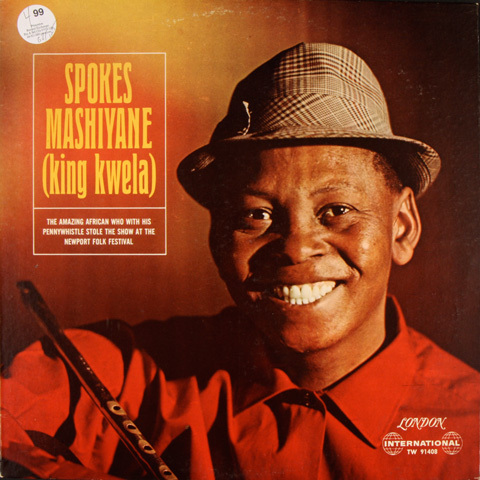 Some readers may recognise the title of the LP as a lyric from Mahlathini and the Queens' 1987 song "Melodi Yalla", a tune that pays tribute to Gallo-Mavuthela by calling it a big melting pot of music - but no version of this song actually appears on this album! 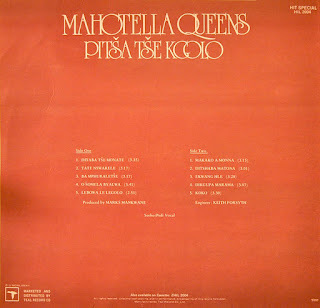 The phrase "pitsa tse kgolo", however, had often been utilised in songs over the years to refer to Mavuthela and its music, so its usage as the title of this 1981 LP is perhaps incidental. "Ditaba Tse Monate" is a nice tune to open the LP. 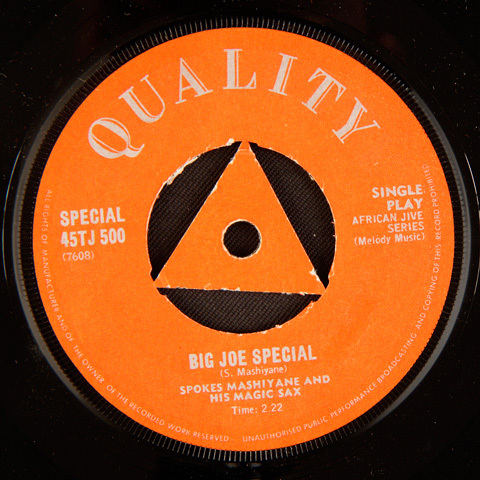 It features some brief lead vocals from vocalist Virginia Teffo (a studio regular since around 1967), lovely Marks guitar, and tight Queens harmonies. Tenor singer Sinah Thibedi takes over in "Tate Nswarele", composed with male soul vocalist Willie Rasebotsa (though his voice does not appear on this album). The pace keeps up through to the Rupert Bopape-Marks Mankwane penned number "Lebowa Le Legolo", a tribute to the North of the country to which this album is dedicated. (Pitsa Tse Kgolo was so popular with Pedi listeners that a follow-up album, Tsa Lebowa, was recorded and released later in 1982.) 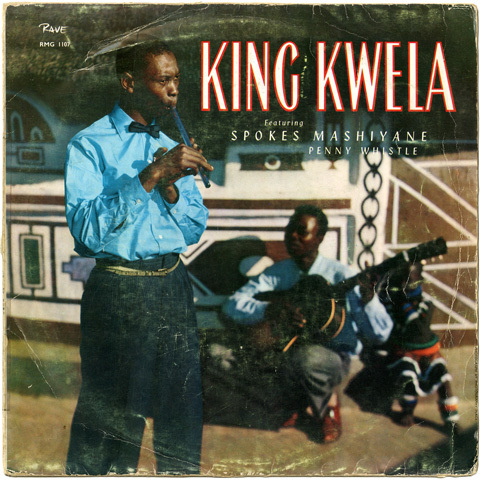 "O Somela Byalwa" is another straightforward tune that contains pleasant and tightly-binding harmonies. "Dikgupa Marama" is something of an oddity in as much as it throws soul into the mix - but that's no bad thing. Marks is clearly adept at playing in different styles and the long honed "strong" vocal styling of the ladies is put to great use here. It isn't a tune to miss, and the same goes for "Koko". 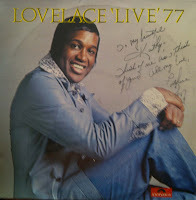 That song, closing the LP, is a lovely soul ballad written by Virginia Teffo in tribute to her grandmother. 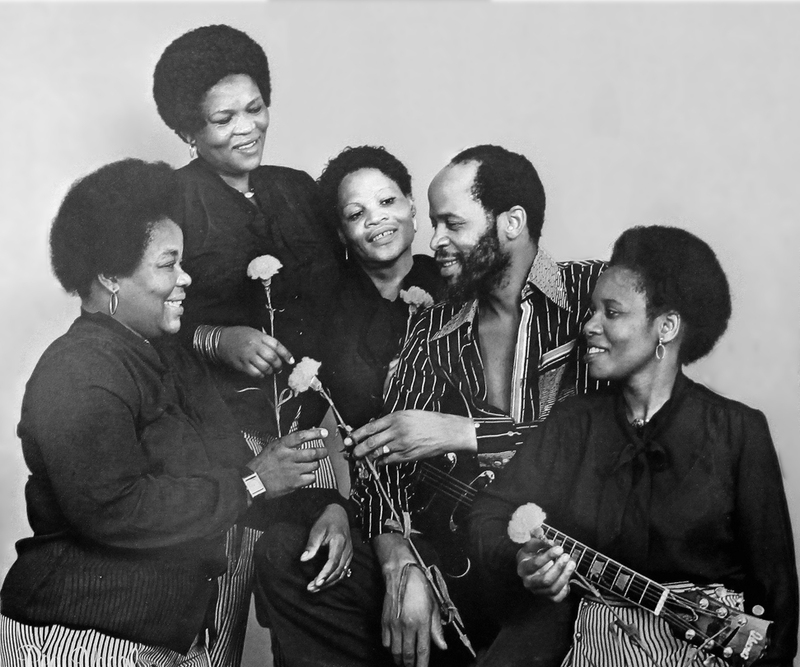 The ladies in 1982, being handed carnations by their producer and mentor Marks Mankwane. 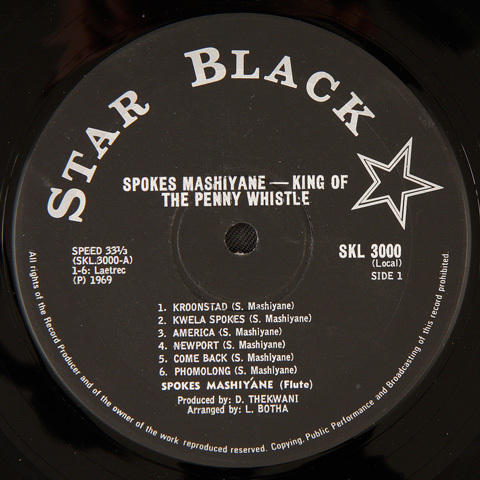 Though by 1981 the Makgona Tsohle Band had dissolved (not reuniting until 1983 after a 6-year break), producer Marks Mankwane had put together a unique combo of musicians which he named The Beggers to back his mbaqanga/soul artists, including the Queens. (If you haven't already, check out Teaspoon Ndelu's wonderful 1981 LP Ke Kopa Madulo, released shortly before Pitsa Tse Kgolo and featuring excellent on-time accompaniment from The Beggers.) Marks the guitar wizard cuts through the rhythmic atmosphere with his talents, backed by virtuoso Mzwandile David on bass and the other Beggers. Pitsa Tse Kgolo features a line-up consisting of Beatrice Ngcobo, Emily Zwane, Virginia Teffo, Sinah Thibedi, Maggie Khumalo and Caroline Kapentar. This was more or less the group that sustained the Queens during the mid-1970s and mid-1980s, until the original (1964-1971) line-up reunited for the international breakthrough. After more than ten months backing Lovelace Watkins on his southern Africa tour, this pedigree collection of musicians laid down a top-notch live jazz gig in Orlando, Soweto. 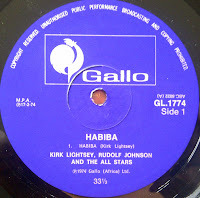 The only difference to the line-up from the February 1974 Kirk Lightsey Habiba recording (see here) is that Monk Montgomery replaces Johnny Boshoff on bass, and Marshall Royal comes in as band leader and first saxophonist. 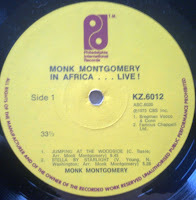 No need to dwell on Montgomery’s impressive credentials, but suffice to note that his musical bloodline goes way back to anchoring Lionel Hampton’s Orchestra from 1951 to 1953. 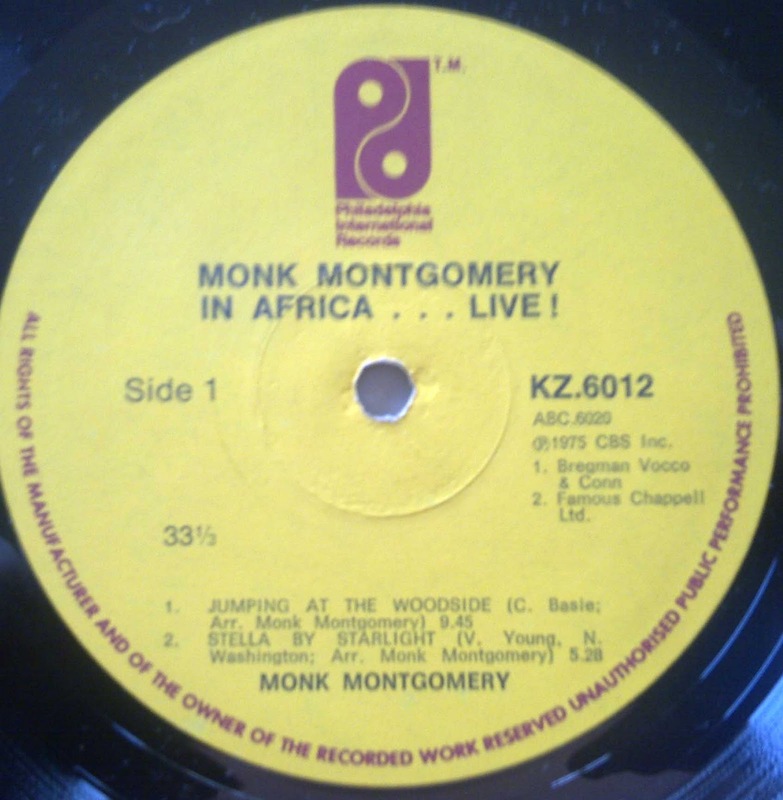 Prior to his southern African touring, Montgomery had been playing with Cal Tjader for five or six years. While associated with Chisa Records, Montgomery recorded a fair bit with Hugh Masekela, including on the first recording of “Grazing in the Grass”. Born in 1921, Montgomery died of cancer at the age of 61 in May 1982 – before he could fulfil his dream of pulling together a “World Jazz Festival”. 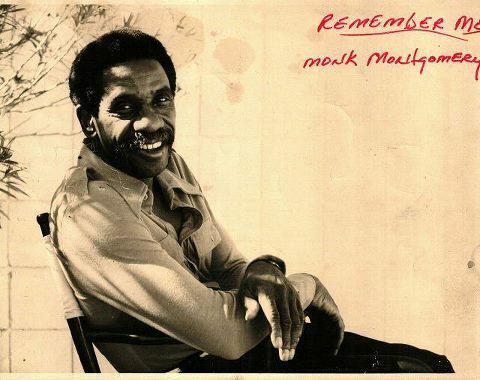 Monk Montgomery gave this picture to Al Hall jnr. ﻿﻿﻿﻿This live ﻿ album has its own special sense of place with the Soweto compere introducing Count Basie’s “Jumping at the Woodside” as “Jumping at the Woodstock”, but Basie’s band-leader of twenty years (Marshall Royal) does not miss a beat and plunges the band head-first into a tight and exciting set. Side two becomes really interesting with an Al Hall jnr composition in tribute to Soweto impresario Ray Nkwe. African echoes abound in an eleven-minute cracker of a track. 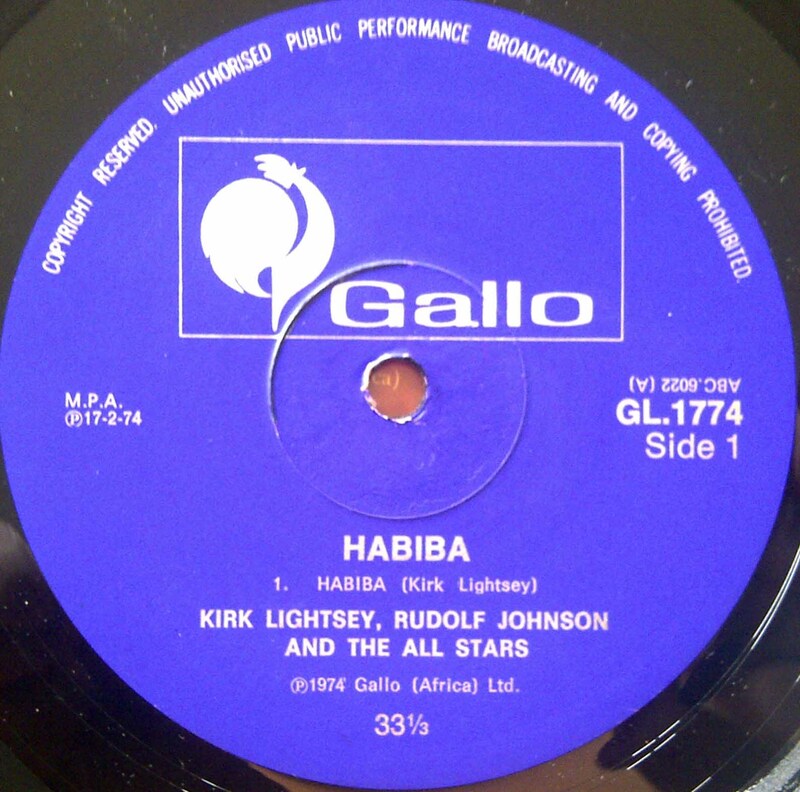 Rudolph Johnson’s “Testing One, Two” rounds off the gig, showcasing both Johnson and Lightsey. In February we will pick up this golden thread again, with two more recordings this twelve-piece band made a month later in Johannesburg. 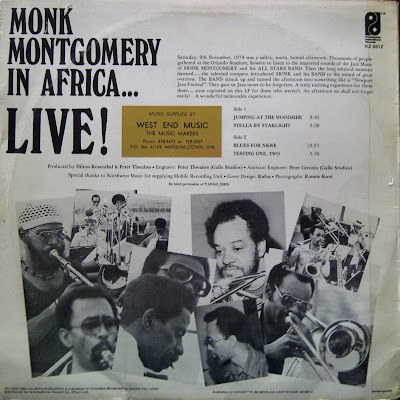 This post is the first in a thread of four worthy bop-oriented albums recorded by a common core of eight jazz musicians (all featured on this recording) while they spent much of 1974 touring South and southern Africa. In kicking off chronologically with Kirk Lightsey’s February 1974 recording, a preface on the special role of one Lovelace Watkins is appropriate. Watkins signed Lightsey to accompany him for five years of playing all around the world from 1974 to 1979. Detroit-born Watkins was a charismatic and gifted singer whose travelling and musical networking seemed to open up opportunities for good things to happen around him. In addition to being highly popular in Europe and Australia, “the Black Sinatra” gigged southern Africa multiple times over a period of ten years from 1971 to 1981. 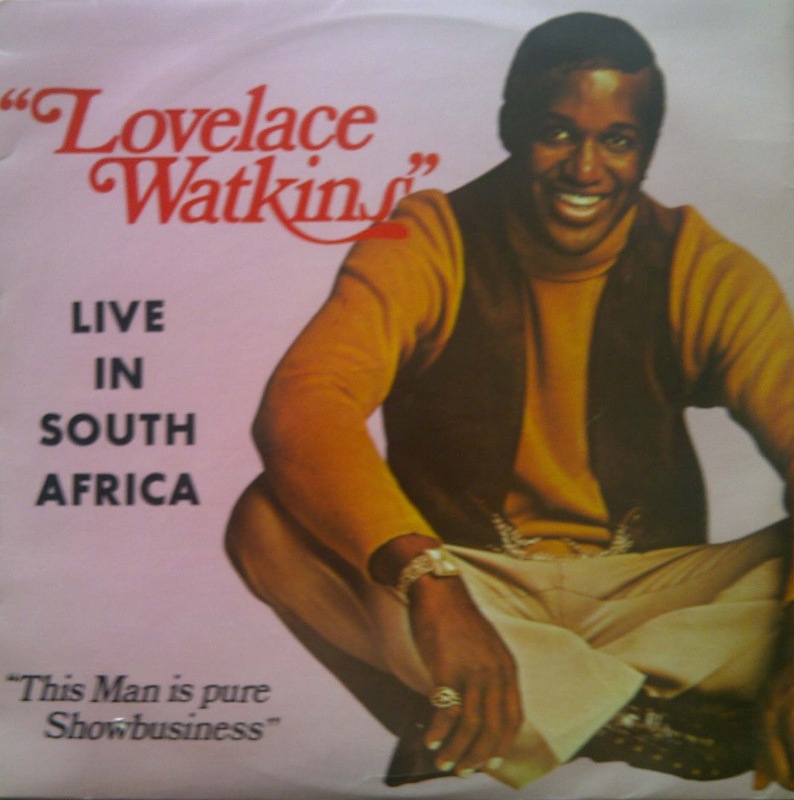 Having developed a massive fan base from earlier tours, it was in 1974 that Watkins was able to invest substantially in bringing out a big band of excellent U.S. jazz musicians to spend the year touring southern Africa. During this time the band members found the space and opportunity to headline their own gigs and also to record on various labels - working around prior contractual obligations. The last three albums in this thread also feature Marshall Royal, Count Basie's saxophonist and band leader for more than twenty years. 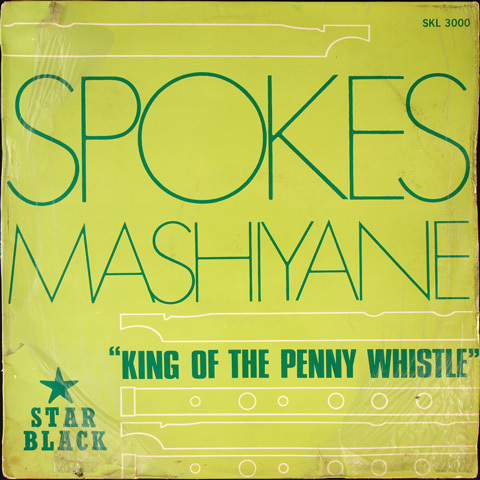 Watkins recorded two albums in South Africa , both of which went gold. Watkins went to number 6 on the south African charts in 1974 with Neil Sedaka’s “The Way I Am”. Download that song here (15th Nov 1974). Watkins died aged 58 in 1995 of leukemia. 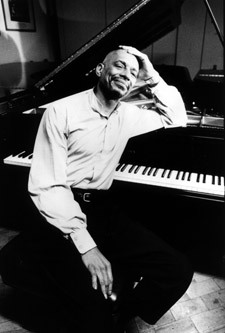 Kirk Lightsey’s enduring keyboard genius stretches back to the 1960s where he appears on five recordings with Chet Baker on the Prestige label. After his five-year stint with Watkins, Lightsey went on to tour with Dexter Gordon from 1979 to 1983. Since then, the last thirty years have cemented Lightsey’s reputation as a gifted modern Jazz pianist with a career that has included sessions with some of the world’s finest jazz instrumentalists, along with a series of classy recordings and solo performances of his own. “On this album a combination of African rhythms and harmonies give licence to the inventive genius of the musicians who explore the moods of black Africa”. 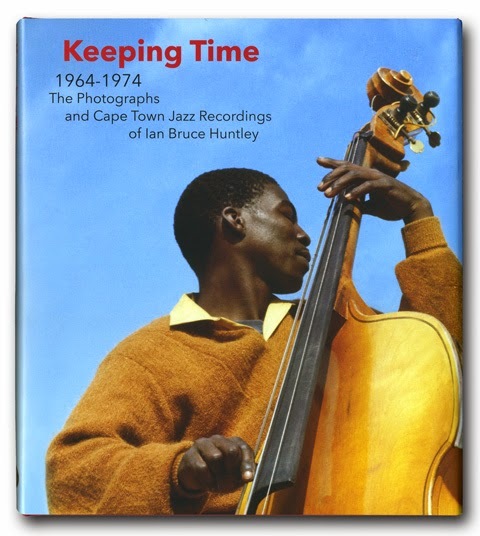 Notable among the listing of U.S.-based jazz musicians is one South African, bass player, producer, writer and engineer, Johnny Boshoff. Boshoff's bass graces numerous genre's of South African recordings from Johnny Kongos, through prog-jazz rock band "Square Set", to Juluka. 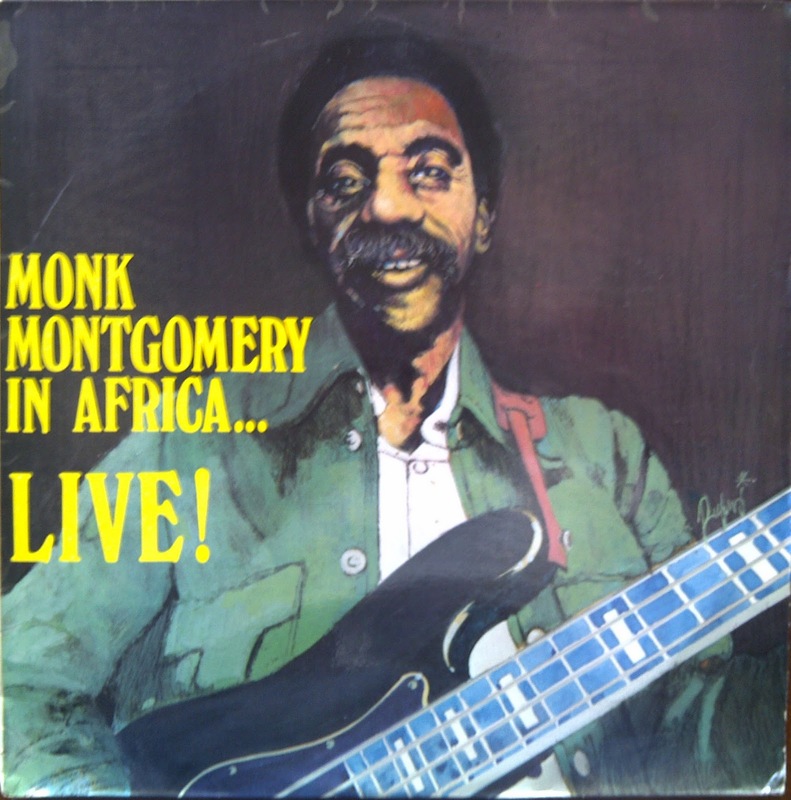 Boshoff ably filled in on three of these recordings because of contractual record label issues with Watkins' own bass player, Monk Montgomery. Montgomery headlines the next record to be shared in this thread, with a 1974 live concert at Orlando Stadium in Soweto. For now, enjoy what has become a sought after and highly rated album! Recorded by Peter Thwaites in the Gallo Studios - February 1974. Album released in February 1975. 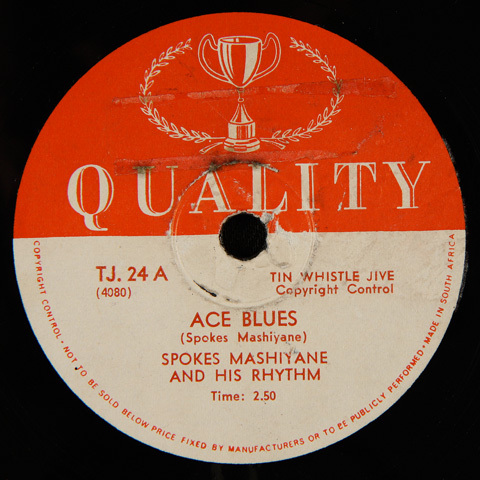 Music with a Mozambican connection has featured twice at electricjive - Chris posted the historic 1955 Gallotone LP with a range of Mozambican fado recordings and Siemon posted a Banda Six album by Mozambican Mofene David Sitoe. So we're spending some time in Mozambique to re-address the balance. But first a little context before the three albums we're sharing today. The first radio broadcast in Mozambique was made on 18 March 1933 by a private club of Portugese settlers based in Lourenço Marques (now Maputo). 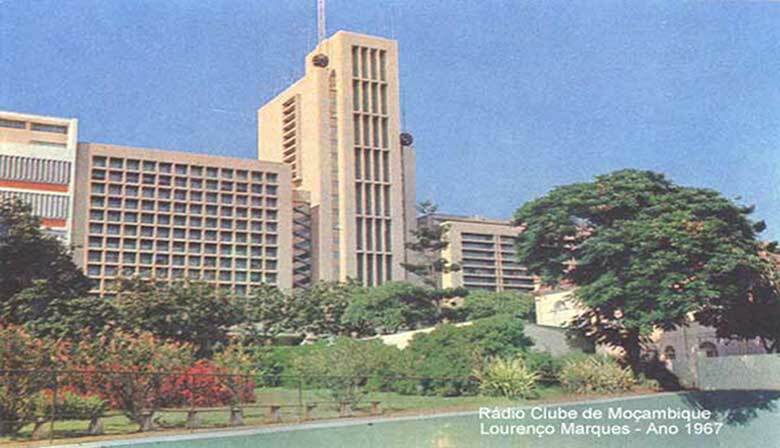 Called Radio Clube de Mocambique the broadcasts went out to an estimated 1400 receivers and in the following years two further private radio stations started in Beira, the country's second largest city after Maputo. In the late 1950s the station underwent a major format change to cater for the younger generation who were not being catered for in South Africa by the state owned SABC. LM Radio as it was popularly known, was world renowned for its Top Twenty chart show and played a major role in promoting South African Artists and their music. LM Radio was taken over by the South African Broadcasting Corporation (SABC) in 1972 and following Mozambican independence in 1974 (the station was occupied by Frelimo) the station was replaced by Radio 5 (now 5FM). As teenagers during the late sixties and early seventies my sisters would tune in to LM Radio on Sunday nights between 8.30 and 9.30 pm to listen to the LM Top Twenty. In the sixties the South African economy - part supported by Mozambican labour on the mines - had grown strongly and affluent, mostly white, South Africans were drawn to the gambling mecca of Lourenço Marques (now Maputo). 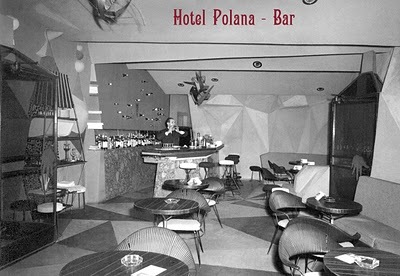 The hotel circuit in LM supported a range of musicians and bands catering for the tastes of this wealthy clientele. A similar "scene" existed in Johannesburg in the early sixties (see some of Eddy de Clerq's posts at Soul Safari) but was under pressure from teenagers seeking alternatives to what their parents were listening to. 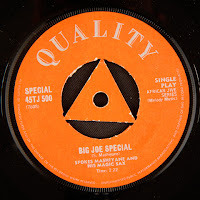 For a small taste of some alternative sounds check out the Cazumbi or Zulu Stomp bootlegs which give a small insight into some mostly white rock and roll sounds issued on 45 during this period. But the challenges of maintaining a colonial war against the freedom movements were stacking up. In 1974 a group of low-ranking army officers rose to overthrow the Portugese government. 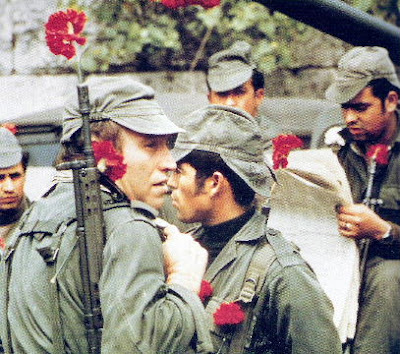 The military-led coup (the so-called Carnation Revolution) returned democracy to Portugal and ended the unpopular Colonial War where thousands of Portugese soldiers had been conscripted into military service in the colonies of Angola, Mozambique and Guinnea Bissau. The name "Carnation Revolution" comes from the fact no shots were fired and when the population started descending the streets to celebrate the end of the war in the colonies carnation flowers were put on the guns' ends and on the uniforms. This led to Mozambique gaining its independence from Portugal on 25 June 1975, after more than ten years of a liberation war conducted by the Frente de Libertação de Moçambique (Frelimo). 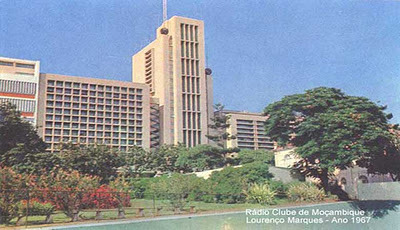 After independence LM Radio and the other two private stations were nationalised to form the state-controlled Radio Mozambique. This did not change until after the South African-backed civil-war ended in 1992 when broadcasting was de-regulated. Beyond the hotels with their exclusive clientele what was happening downtown, or across the tracks on the other side of town? 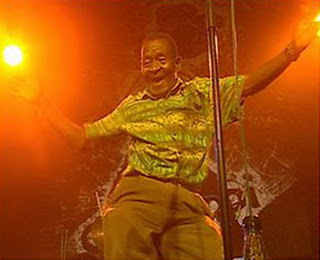 The answer is Marrabenta, a form of Mozambican dance music that emerged in the 1950s in the urban areas of Maputo. The name was derived from the Portuguese rebentar (arrabentar in the local vernacular), meaning to break (the guitar strings). 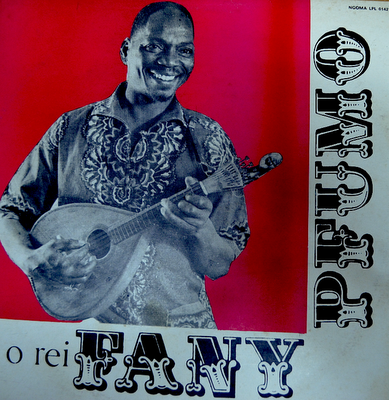 Influenced by Mozambican and Portugese folk music and also Western pop, the earliest marrabenta artists include Fany Pfumo, Dilon Djindji and Wazimbo. Dilon discovered his love of music at a very early age, and in 1939 built himself a three-string guitar made from an oil can. Three years later this home made effort was replaced with a six-stringed version and he began performing at parties and ceremonies with his uncle, Antonio Chikonela Jinge, and friend, Xavier Santos Pfumo. When he completed his studies in 1947, he became a pastor, and went to work on the island of Mariana, where he continued to play music as well. Besides playing such popular styles as zukuta and magica with musicians like Constancio Machiano and Ernesto and Armando Magaia, Dilon began experimenting with marrabenta music. In 1960 Dilon founded his first band, Estrela De Marracuene (Star Of Marracuene). Other firsts were to come: four years later he made his radio debut, and in 1973 his first single ('Xiguindlana') was released by Producoes 1001, where he was working as a production coordinator. Thanks to his energy and enthusiasm for the music, as well as the hundreds of performances he notched up around the country, Dilon made the music famous. Fany Pfumo and Wazimbo were similarly active in various Maputo bands in the 1960s. 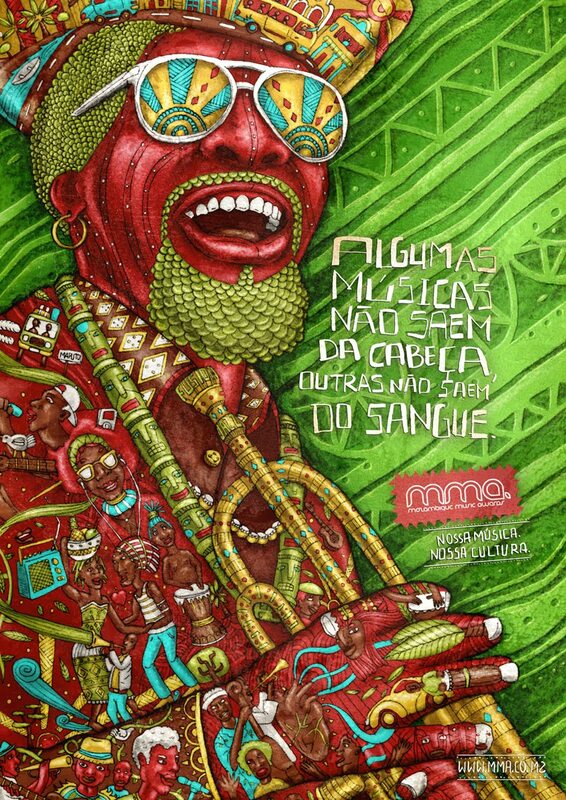 After Independence Wazimbo worked with the big band of Radio Mozambique which went on to become Orchestra Marrabenta Star De Mocambique. 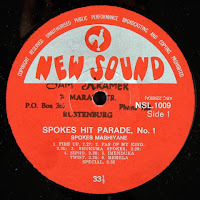 They were also one of the first bands to release an LP with a European "World Music" label (Germany's Piranha) and were noted for their funky style of marrabenta with electric guitars, powerful horn lines and soulful vocals. 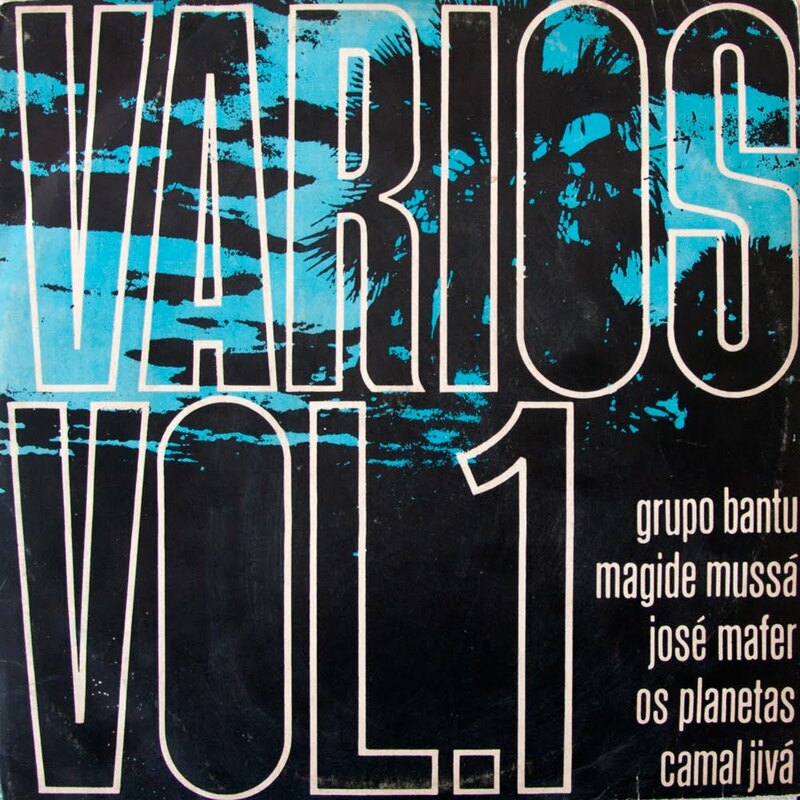 On the "World Music" wave came other Mozambican bands like Eyuphuro, Ghorwane and compilations on Globestyle (the two volume "Mozambique 1" and "Mozambique 2" are still in print on CD and well worth checking out. 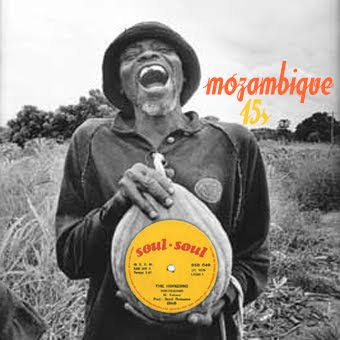 And so today electricjive is proud to present some forgotten recordings of Mozambique. 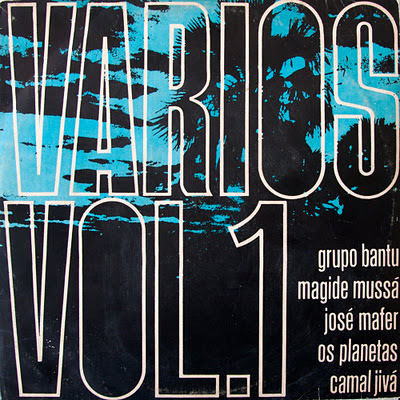 The first is a compilation from 1980 - simply entitled Varios 1, on the local Ngoma label featuring a range of artists. The second is mid eighties album from key Marrabenta star Fany Pfumo. Book-ending the eighties is a compilation of singles from Maputo that first featured at my matsuli site. This includes a fantastic lead track from Fumo again. Enjoy your visit and time with us in Mozambique today. And finally to close Sam Mangwana's classic Mozambique Oye praising the Mozambican struggle for independence from Portugal. A Luta Continua! Information sources: Calabash, World Music Network and National Geographic. Welcome back to Electric Jive! 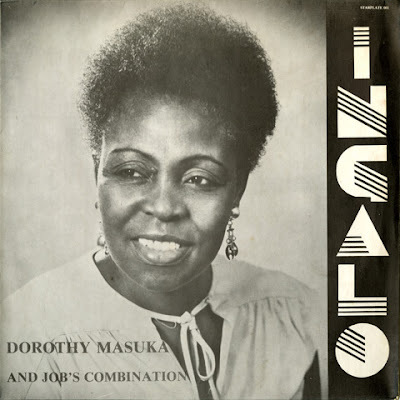 Today we open 2012 with quite an uncommon offering — the very first LP by South African legend Dorothy Masuka. 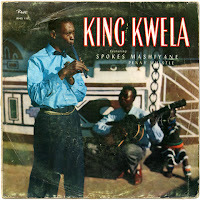 Although recording many hits on 78 rpm for the South African Troubadour label in the 1950s, Ingalo was Masuka's first full-length album. 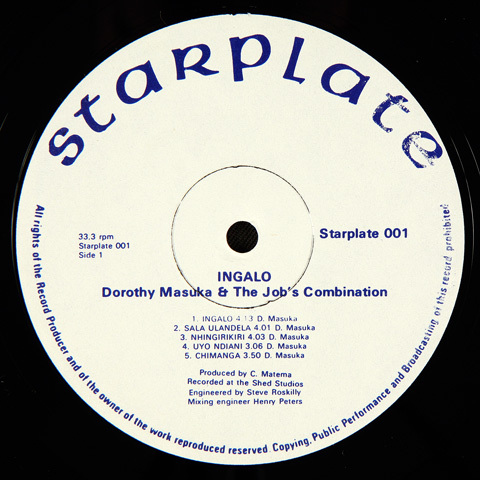 Backed by Lovemore Majaivana and Job’s Combination, this Zimbabwe-only pressing was recorded and issued around 1981 on the Starplate label. According to Rob Allingham, Masuka was born to parents of Lozi and Zulu origin in Bulawayo, Southern Rhodesia (now Zimbabwe) in 1935. When she was twelve, for reasons of health, she was transferred to St. Thomas Covent, a Catholic boarding school in Johannesburg. It is here, through a connection of one of her teachers, that Troubadour talent scouts Ben Ledwaba and Cuthbert Matumba heard her performing in a school concert. By sixteen, Troubadour had arranged a contract with Masuka’s mother that gave the company a form of legal guardianship over her and, as they say… the rest is history! 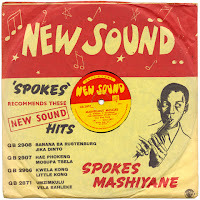 Masuka’s first big hit with Troubadour was Hamba Notsokolo (Troubadour, AFC 170) recorded when she was just eighteen in 1953. This tune, a South African classic, was revisited by her at least three times during her broad career and a less well-known version is featured here as Notsokolo on the Ingalo LP. According to Z.B. Molefe, in the book A Common Hunger To Sing, one of Masuka’s first recordings (if not the first) was Into Yam also made in 1953. This song was most famously covered by Miriam Makeba in Lionel Rogosin’s clandestine, 1959 film Come Back Africa. This is also the same tune that introduced Makeba to the United States in her first television performance on the Steve Allen show in November 1959. Indeed some of Makeba’s biggest hits were originally Masuka compositions, most notably Phata Phata, Ha Po Zamani, Khawuleza, Kulala, Khanyange and Teya Teya to name but a few. 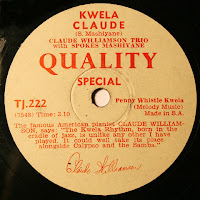 Some of these tracks can be viewed on the post Makeba — Track Less Travelled here at Electric Jive. Masuka’s 1980s version of Teya Teya is also featured on Ingalo as Teyateya. 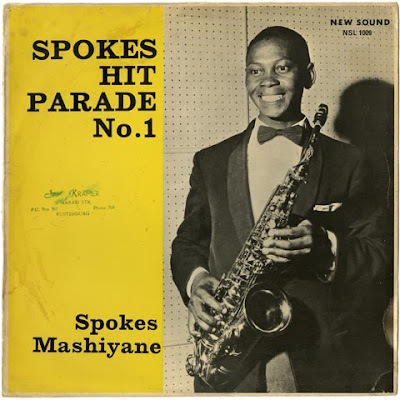 Troubadour at times controlled nearly 75% of the African market and Masuka was their first and biggest star — making her one of the leading South African recording artist of the 1950s. 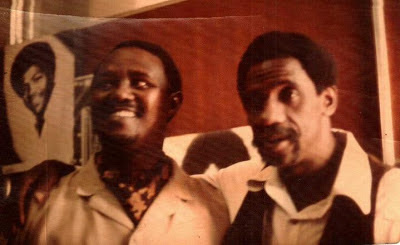 As producer for Troubadour, Cuthbert Matumba was open to recording songs that sometimes contained critical commentary, and the company occasionally drew visits from the Special Branch of the police, who often confiscated masters and copies of records. In 1961, Masuka wrote and recorded the song Lumumba, in response to the outrage over the execution of the newly elected Congolese leader. The South African Special Branch took note and confiscated the master and began searching for Masuka. In the meantime, she returned to Bulawayo and remained there on the advice of Troubadour. After the incident, Masuka was declared persona non grata by the South African authorities and was forbidden from re-entering the country. She remained in exile from South Africa for the next 31 years. Masuka would spend the following years travelling and performing in Africa and Europe. 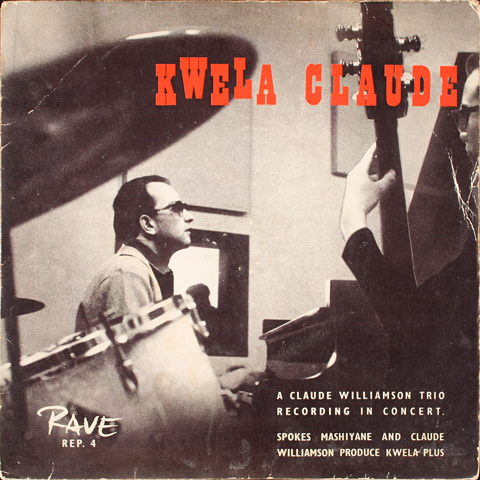 In 1965 she returned to Rhodesia for a performance. After hearing that the Ian Smith Government was planning to arrest her, she moved to Zambia where she remained in exile for the next sixteen years as a flight attendant for Zambian airways. After Zimbabwe independence in 1981 she returned to the country and resumed her recording career with the album featured here, Ingalo. 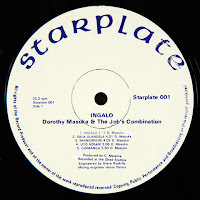 According to the liner notes, Ingalo was Masuka’s first full-length album. (View the liner notes at flatinternational). 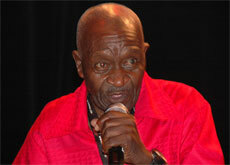 The recording was made and produced in Zimbabwe by Crispin Matema sometime in the early 1980s. Lobegula Nkosi, a contributor to inkundla.net (#385), reveals that Jobs' Combination, was a short-lived band formed by Lovemore Majaivana and Fanyana Dube, and recorded with Masuka after their first album Istimela was released in 1980. According to Nkosi, the group soon split-up. The post also discusses Majaivana’s subsequent abandonment of his music career. View more information on Lovemore Majaivana here at Nehanda Radio. 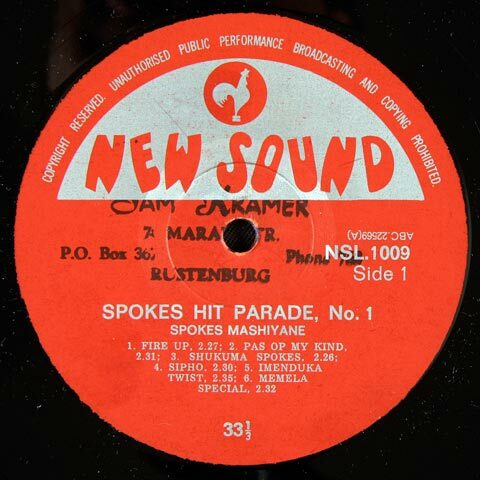 An excellent compilation of Masuka’s early work on 78 rpm from her Troubadour period can be found on the CD reissue Hamba Notsokolo (Gallo, CDZAC60) featuring detailed notes by Rob Allingham (and from which much of the above information is drawn). Finally, the title track of the LP, Ingalo, is one of my favorites and was also featured on one of my early all-South African mixes posted at Matsuli in December, 2008. For this occasion I have re-posted those two mixes — volume 1 and 2 — here at the flatint blog.